Thoughts on food from an Auckland blogger. You may remember a post I wrote last year about medium-rare burgers in Auckland. Well, that's old news. 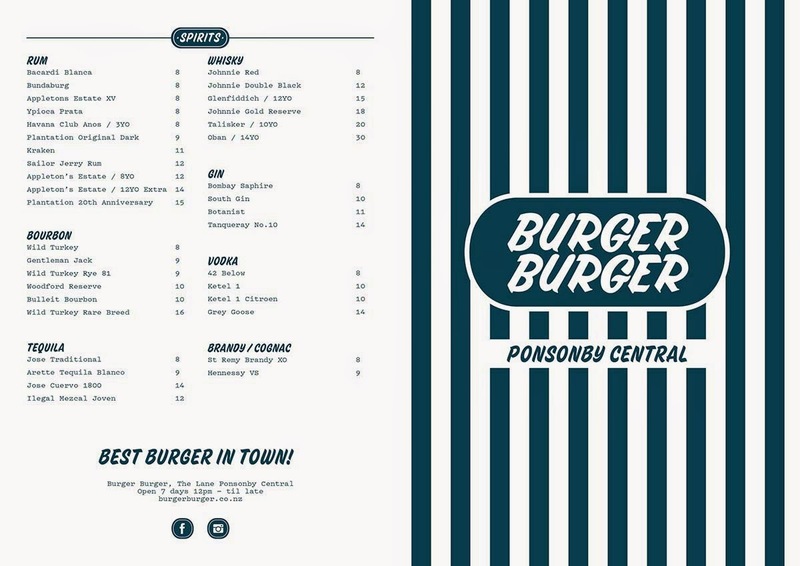 A week or two ago, Burger Burger opened in Ponsonby Central, and blew the competition out of the water. Not surprisingly, it has become enormously popular already, with queues forming outside at peak times. Vibrant decor inside the little eatery. Situated next to Maldito Mendez, where Wang Thong Thai Fusion used to be, this little place really knows their burgers. The bun is sweet and soft, and grilled to perfection with lightly charred edges. The meat, whichever form you choose, is fresh, and most importantly, the beef is served medium-rare by default. The chefs, five or so of them in the narrow kitchen, move like clockwork, assembling burger after burger to order, so that your rumbly tummy is satisfied as soon as possible. The beef burger we had (after much umm-ing and ahh-ing, we also added aged cheddar cheese) was by far the best we have eaten in Auckland. Not only a pleasure for the tastebuds, it was also easy on the pocket, costing only $10 for the burger and $2 for any additions. 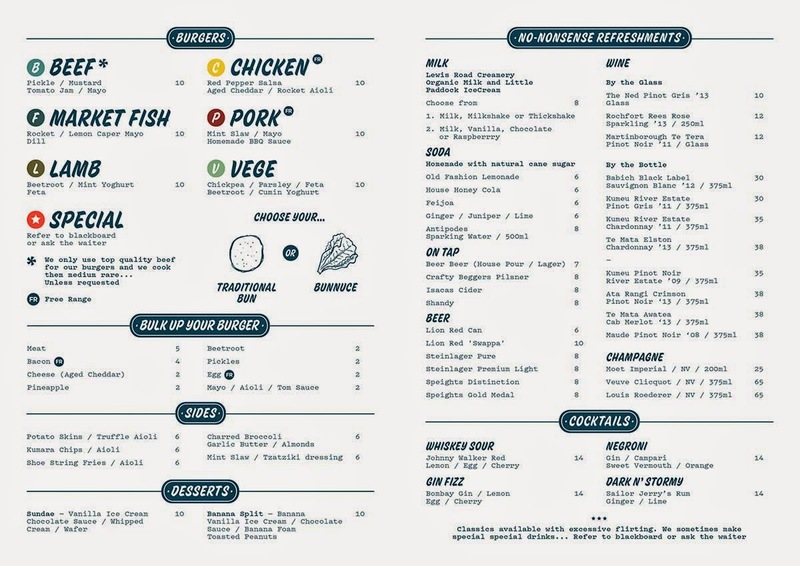 If we were forced to critique, the only improvements we would like to see are a) giving a processed cheese option, and b) maybe replacing some of the pickle (there was a lot of it) with lettuce. The chicken burger was excellent as well, with the meat expertly chargrilled, and deliciously paired with rocket aioli and a capsicum salsa. The fish burger was also beautifully cooked, with a freshly fried crumbed coating. In fact, pretty much all the burgers were fantastic, the highest quality we have encountered, and great value at BurgerFuel pricing. Burger lovers who are vegetarian or gluten intolerant are also catered for, with a falafel patty version, as well as the option of swapping the traditional bun for "bunnuce", a.k.a. cos lettuce leaves. Vege bunnace for a greener fix. The sides are great too. The shoestring fries we ordered were fresh and crispy, not at all oily-feeling, and came with a generous portion of aioli. House honey cola and shoestring fries with aioli. The charred broccoli is healthier but also very tasty, with garlic butter and toasted almonds adding to the flavour. Charred broccoli with garlic butter and toasted almonds. If we weren't already so full, we would have loved to have tried the milkshakes, made with organic milk from Lewis Road Creamery and ice cream from Little Paddock. Like the house-made honey cola pictured with the fries above, these came in thin glasses shaped like soft drink cans, and had syrup drizzled down the sides. There is also a large selection of alcoholic drinks. Oh, and dessert. It's not just the food which is great at Burger Burger. We love the thought and design that has gone into the brand, the friendly and talented young staff members who informed us all the sauces and things were made in-house (though service can be hit-and-miss), and the reasonable pricing despite quality ingredients. You are having burgers for your mains, no question of that. 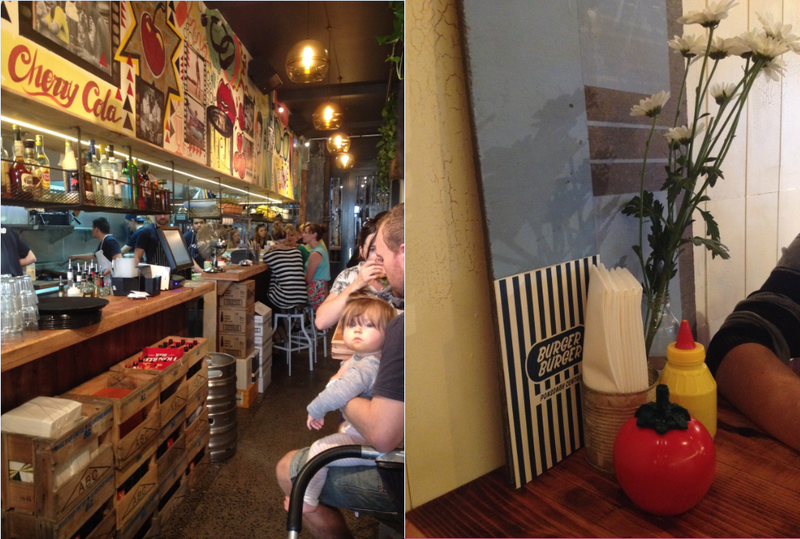 We like the classic beef burger ($10, optional cheese for an extra $2), but really, practically everything is good. Well, maybe the vege burger isn't as great as all the hype would lead you to hope for, but at least you haven't been forgotten about. Plus, you have sides and desserts to try too. Entrance to the little eatery. Panda loves to hear from people. Thanks for leaving a comment! If you are logged in using your Google account, don't forget to click the "Notify me" checkbox (below the comment box on the right hand side), so you know when I write back.